Events in northern Virginia on and near the old Bull Run battlefield during the last week of August 1862 are instrumental in setting in motion a chain of events that will climax at Sharpsburg three weeks later. Even though he and his fellow soldiers of the 8th Connecticut are not directly involved in these events, Oliver Case’s future will be determined by what happens here. During this week, Confederate General Robert E. Lee sends the troops of General Thomas J. “Stonewall” Jackson to attack Union’s Army of Virginia commanded by John Pope. On the 28th of August, Jackson ordered his commanders to attack Pope’s column moving along the Warrenton Turnpike. Although the Confederates have the element of surprise, there is no clear winner at the end of the day. It is the belief of Pope that he has pinned down Jackson and plans to finish him off the following day. On the 29th, Pope concentrates his army in an attack against the Confederates who have taken positions in an unfinished railroad cut. Jackson’s troops turn back multiple attacks, but the casualties are heavy for both the Confederate and Union units. Pope seems unaware that almost 30,000 troops under General Longstreet are arriving on the field beginning at noon. Longstreet assumes positions to the right of Jackson. On the third day of fighting, Pope again attacks Jackson with seeming disregard for the forces of Longstreet on his left. This is a serious mistake as Longstreet unleashes a massive artillery barrage against the attacking Union troops under Fitz John Porter. Longstreet follows with the largest mass assault of the war by all of his units slamming into the Union left flank driving them back across the Bull Run battlefield where they established defensive position on Henry House Hill. As darkness approaches, Pope orders an orderly retreat to Centreville. The Confederates are unable to pursue due to the darkness, fatigue and low supplies of ammunition. In Fredericksburg, Burnside is put on notice to be prepared to move his army to the north in support of Pope. On the last day of August, the 8th CVI is withdrawn from picket duty and returns to the city of Fredericksburg in anticipation of supporting future defensive operations to protect the city of Washington. On [August 31st] the Eighth was withdrawn from picket beyond Fredericksburg, and retired through the town and across the river, greeted by the scowls and taunts of the rebel citizens, who threatened to fire upon the column from their houses. History of the Eighth Regiment C. V. Infantry, J.H.Vaill, Case, Lockwood, and Brainard Co, Hartford, 1889. From Fredericksburg, Virginia on August 7, 1862, Oliver Cromwell Case will write his last letter…at least the last letter known to exist 150 years later. He is worried that Abbie and the rest of his family would be reading the news of the movement of Burnside forces with apprehension regarding Oliver’s safety. Knowing you would be anxious to know of my whereabouts, I take the first opportunity of addressing a few lines to you. Over one month earlier, the regiment, as part of Burnside’s expeditionary force, had relocated from their base of operations on the coast of North Carolina to Newport News, Virginia awaiting orders to potentially support George McClellan’s push to Richmond. However, things have gone sour for Little Mac as Robert E. Lee has taken command of the Army of Northern Virginia leading his troops to a series of victories causing McClellan to back away from Richmond. Burnside is once again ordered to relocate his force to Fredericksburg. 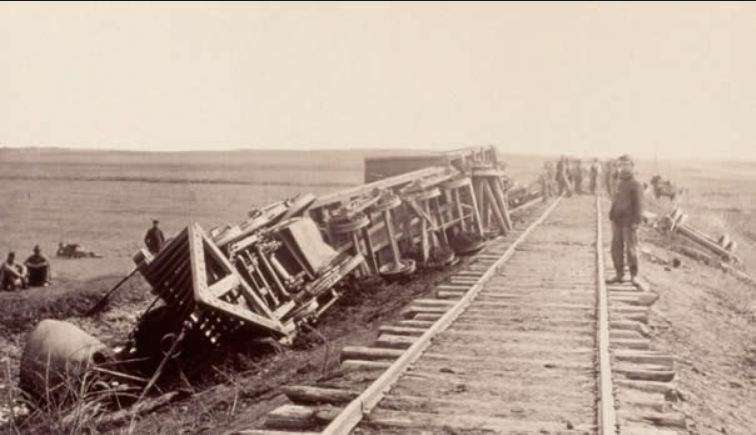 We left camp at Newport News, Saturday, August 2nd about 10 o’clock P.M. and went aboard the steamer “Columbia.” I was one of a detail of 75 men to load and unload baggage and convey it aboard. We were detail at 4 P.M. and finished at 3 A.M. Wednesday morning. I can tell you we felt like sleep about the time we finished our work. For Oliver and his fellow soldiers, the journey from Newport News to Acquia Creek via Fortress Monroe is not pleasurable. A crowded ship and the hot summer weather make conditions miserable. We were all put upon one small steamer – baggage, horses and all – and the weather was hot, hotter, hottest. You can judge of the room we had but I was fortunate enough to get a place upon the hurricane deck and got all the breeze there was. We left the dock, or rather the steamer started the trip, about noon. We left Fortress Monroe at 4 P.M., arriving Aquia Creek next P.M. Went ashore next (Tuesday) morning, took the cars for the South. Here again I was fortunate enough to get on top of a box car and was quite comfortable while the train was in motion. Oliver and the 8th CVI made their camp on the grounds of the famous Lacy House (aka Chatham Manor) across the river from the city. 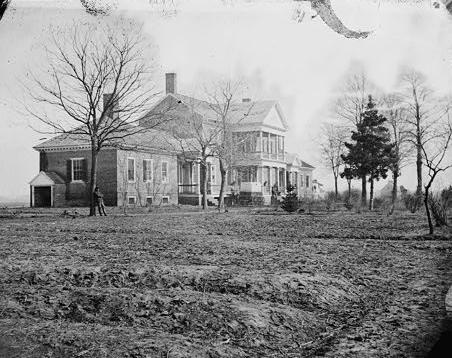 Previous guests of the Chatham Manor included George Washington and Abraham Lincoln who had visited for a meeting with Union General Irvin McDowell just four months prior to the arrival of the 8th Connecticut. Oliver’s keen eye for the details of the geography and landscape is once again at work in this letter. The road runs through the finest country I ever saw and contrasts strangely with the country we have seen heretofore. The place where we at last brought up is the pleasantest place I ever saw. The railroad runs through a fertile valley with low hills upon each side. We toiled up one of these hills to the east with our knapsacks and accoutrements on under a blazing sun, many falling out by the way. 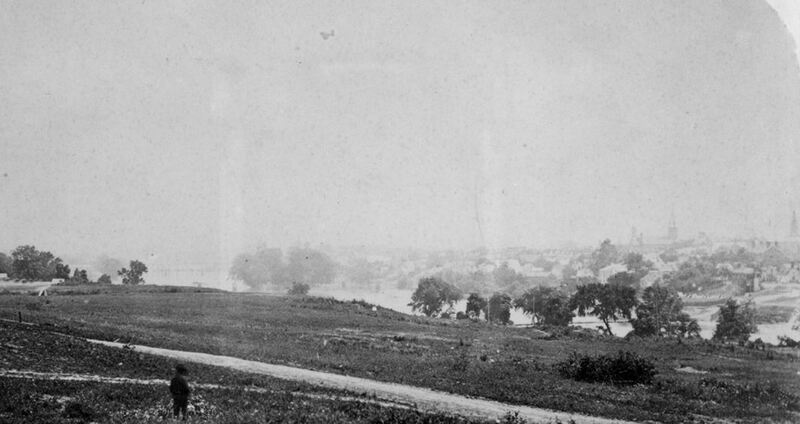 After supper, on reaching the top of the hill, we had a splendid view of the city of Fredericksburg and the village of Falmouth which lie west of the railroad upon either side of the Rappahannock. His assessment of the new surroundings continues with his usually comparison to something familiar back in Connecticut. There are very many nice farm houses surrounded by any quantity of shade and fruit trees – some built the same style as Chester Seymour’s, but nicer. One peculiarity about the hilly land here is that it is so free from stones of any size and the land is comparatively smooth and the hills nearly regular. I saw some that were perfect cones and others that are in ranges so the sides are like the sides of a huge roller. Toward the end of the letter, Oliver reminds Abbie that the beautiful countryside is beset by a dangerous situation. There are picketing skirmishes nearly every —— (words missing) —— We shall probably advance in a short time. His last words to his sister are of a practical nature dealing with the disposition of money he is enclosing for her. However, Oliver is unsuccessful in having the package containing the letter and the money sent via the Chaplain so he adds a note to the bottom of the letter dated August 9th that he is removing the money. So ends the last known letter of Oliver Cromwell Case. As the 150th anniversary of the Battle of Antietam approaches, so does the anniversary of Private Oliver Cromwell Case’s march toward destiny on those rolling hills outside Sharpsburg. 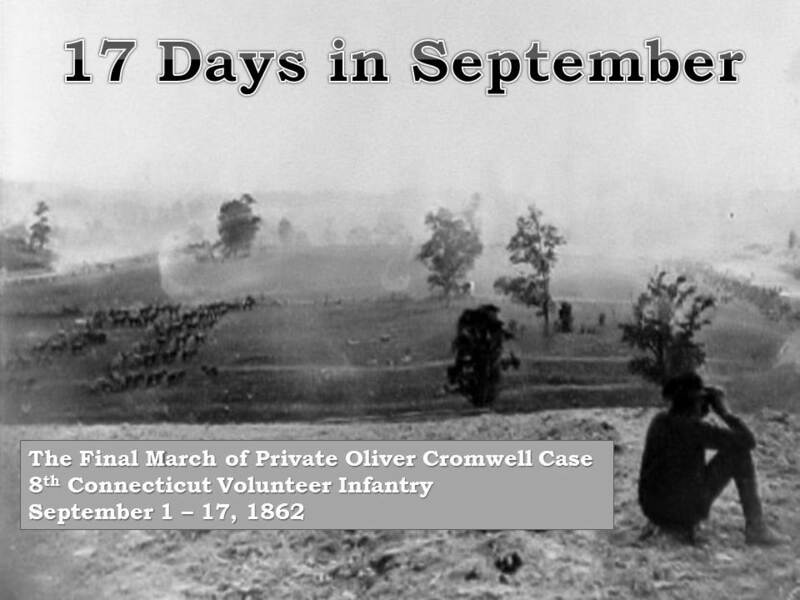 The first 17 days of September 1862 would find Oliver and his fellow members of the 8th Connecticut Volunteer Infantry often on the move and under the sound of the guns. It was a time of great anticipation and anxiety for the young Private Case. Unfortunately, Oliver’s letters to his sister disappear from the historical record on August 7, 1862. So, to honor his memory and dedication to duty, I am attempting to recreate what those 17 days must have been like for Oliver. Beginning September 1st and for 16 days thereafter, I plan to post on what happened that day in Oliver’s life and the associate events shaping his world. Your contributions to the picture of those 17 days in September are welcomed! Beginning in June of 1862, we are unfortunately left with a significant thinning of the letters written by Oliver Case. For June, only one letter written to his sister Abbie on the 3rd and another addressed to an unknown friend from the 6th of June are known to exist. The letter to Oliver’s friend is available for sale at the Excelsior Brigade. We were again ordered to prepare for review and again took up the line of march for metropolis. We were reviewed and inspected by Gen. Burnside and aides and paraded nearly all over the city. Morning rain showers had significantly increased the humidity and the soldiers standing in the ranks began to feel the effects as they waited for their equipment to be inspected. Tonight a number fainted and had to be taken out of the ranks during the inspection which was tedious. Although Oliver did not faint during the inspection, he confesses to Abbie that he is not able to withstand the return march to camp. As soon as our regiment reached the bridge to go back, I fell out and after resting a short time went back into the city, bought a good supper and then strolled around where I pleased, my gun and equipments being as good as a pass for the patrol took me for one of themselves. I did not arrive in camp until 8 o’clock. One of the strong points of agreement between the two letters is another of Oliver’s typical descriptions of southern cities. However, while still not fully impressed with the host city, Oliver’s assessment of Newbern is much kinder than previous evaluations of cities such as Annapolis. Newbern is one of the pleasantest cities I ever saw for its streets are shaded by large trees which meet overhead which makes the streets pleasant that otherwise would be uninhabitable. The streets are regularly laid out but the houses for the most part are low wooded buildings and would compare unfavorably with any out of the way neighborhood at the North. Oliver is uncertain as to how long the expeditionary force will remain in this part of North Carolina “and where we shall go to when we leave are all questions for the guessers.” What is certain is that we will not hear from Private Oliver Cromwell Case again for two full months when the regiment is encamped at Fredericksburg, Virginia. Case letter, 3 June 1862. Case letter, 6 June 1862. Capt. Ward has been promoted to Major, our old Major Appelman having been promoted to Lieut. 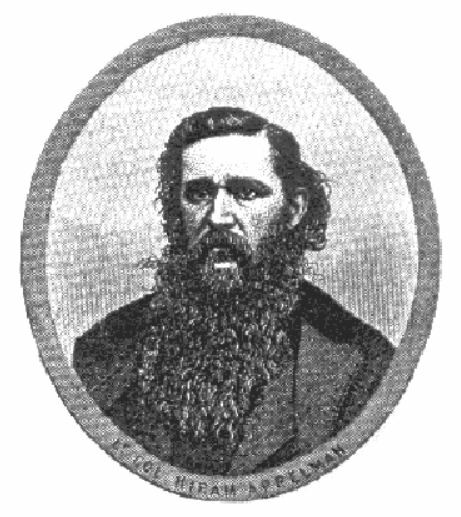 Col.
“Our old Major Appelman” refers to Hiram Appelman born in Groton, Connecticut on June 23, 1825 the son of John F. Appelman who had immigrated to Connecticut from Wolgart, Sweden in 1806. The elder Appelman settled in Mystic to pursue his work as a shipping captain and was later followed by several of his sons into that vocation. Hiram elected a different career path going to work in the retail dry goods business. Prior to the outbreak of the Civil War, Hiram decided to go west in pursue of the riches of the gold rush moving to Sacramento via San Francisco in early 1849. He worked as a very successful businessman in California until 1856 when he returned to Connecticut. Appelman didn’t let the grass grow under his feet as moved to Kansas within a few weeks of his coming back east. He returned to Connecticut again in October of 1858 where he began his studies to become an attorney. His new career plans were interrupted as he became one of the first men in his town to enlist for service in 1861 at the beginning of the Civil War. Hiram Appelman enlisted as a private in Company C of the 2nd Connecticut Volunteer Infantry Regiment on May 7, 1861 where he saw combat during the First Battle of Bull Run in July of 1861. As a member of a three-month regiment, Appelman was discharged on August 7, 1861 upon the deactivation of the 2nd CVI. Within six weeks, Appelman had returned to service in a new Connecticut regiment, joining as a captain in command of Company G of the 8th CVI. As we are told by Oliver in his letter, Captain Appelman, earlier promoted to Major in the regiment, was advanced to the rank of Lieutenant Colonel in May of 1862. He was twice wounded in combat at Fort Macon during Burnside’s North Carolina operations and a more serious wound incurred at Antietam from which he would carry a bullet in his leg for the rest of his life. After being forced to resign due to the effects of his wounds in December 1862, Appelman returned to Connecticut and resumed his legal studies. He was admitted to the Connecticut bar in February 1863 and pursued a career in the political arena rising to election as the Secretary of State for Connecticut in 1869. However, the lingering effects of his wounds from Antietam caused his health to fail and forced Appelman to resign his position in 1873. Hiram Appelman died on September 4, 1873 and is buried in the Elm Grove Cemetery in Mystic, Connecticut. The other officer mentioned by Oliver in his letter is John E. Ward. 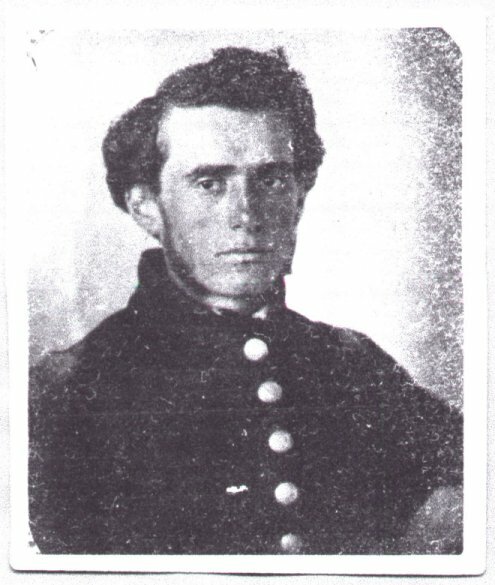 John E. Ward of Norwich originally enlisted in Company D, 3rd Connecticut Infantry Regiment as a sergeant on May 11, 1861. Interestingly, Company D was commanded by Captain Edward Harland of Norwich, the future colonel of the 8th CVI. Ward participated in the First Battle of Bull Run and was promoted to First Lieutenant during his time in the regiment. As a three-month unit, the 3rd Connecticut was mustered out of service on 12 August 1861 and Lieut. Ward was honorably discharged on the same day. Ward would return to service with the 8th CVI as the commander of Company D enlisting on September 21, 1861. As indicated by Oliver, Ward advanced to the regimental staff after his promotion to major in May of 1862. After Lieutenant Colonel Appelman was wounded during the final assault at Antietam, Major Ward assumed command of the regiment and would write the final report on the action. He was promoted to Colonel and permanent command of the 8th CVI on April 2, 1863. During the Battle of Port Walthall Junction, Virginia on 7 May 1864, Colonel Ward was severely bruised by a shell. He was discharged from the service on March 13, 1865 upon the expiration of his term of service. Hiram Appelman packed a lot of living into a brief life, Carol W. Kimball, “The Day” newspaper, August 26, 1999. Transactions of the Kansas State Historical Society 1907-1908, Vol. X, edited by Geo. W. Martin, Secretary, State Printing Office, Topeka, 1908. History of New London County, Connecticut, D. Hamilton Hurd, J.W. Lewis & Company, Philadelphia, 1882. Oliver Case may have been a lowly private in Company A of the 8th Connecticut Volunteer Infantry Regiment, but he was always a man in the know. His letter of May 30, 1862 written from Newbern, North Carolina gives his sister Abbie the latest news of several important promotions. Oliver tells Abbie that very little has changed in the regiment since his last letter written six days earlier “with the exception of a change in the officers of the company.” He first mentions the promotion of Wolcott P. Marsh to Captain. Lieut. W.P. Marsh has been promoted to Capt. of Co. F. It was a surprise to our company as well as theirs and it was universally regretted by the men as he was an officer thought everything of by them. Marsh was promoted and given command of Company F of the 8th CVI. The former Lieutenant of company A was well known to Oliver as described in at least eight of Oliver’s letters. Walcott Marsh was born in Brooklyn, New York in 1839 making him roughly the same age as Oliver. 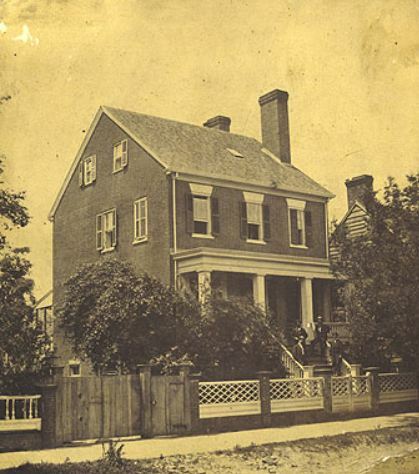 Sometime prior to 1860, he relocated to Hartford, Connecticut where he married Anna Thompson and worked selling knives. Marsh originally enlisted in the 1st Connecticut Infantry Regiment at the beginning of the war and was discharged after the First Battle of Bull Run when his three-month enlistment expired. He received a commission as second lieutenant in the 8th after enlisting in September 1861. Marsh was promoted to first lieutenant while still in training with regiment at Annapolis on December 24, 1861. 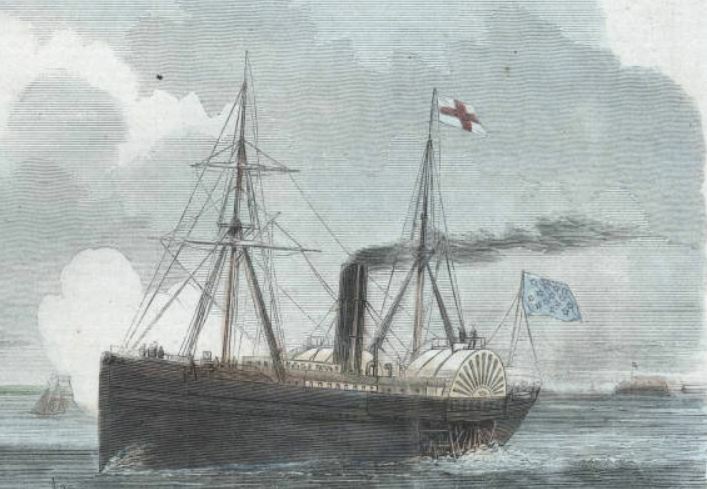 There is some ambiguity in the official records as to the date of Marsh’s promotion to Captain and transfer to Company F. However, putting together the evidence from the records and Oliver’s letters, it appears that Marsh was promoted in May 1862. He was transferred to Company F replacing Elijah Y. Smith of Plainfield who resigned as company commander on March 28, 1862. This move prompted concern on Oliver’s part as to the effect on the first lieutenant in Company F.
How it will go down in Co. F I do not know for the Lieut. [Main] that came out with them as first Lieut. is in the same position at present while our old Lieut. [Marsh] came out as 2nd and is now promoted over him. The slighted lieutenant was Edwin G. Main of Brooklyn who later died of wounds received at Antietam and is the subject of a recent post on John Banks’ excellent Civil War blog. Captain Marsh would resign on December 22, 1862 after the Fredericksburg Campaign suffering from malaria and unable to continue his duties. Orderly Broatch is promoted to 2nd Lieut. of this company. He was presented with a sword and sash by the boys. It took him entirely by surprise and his attempt to make a speech was a failure. Orderlies are soldiers selected on account of their intelligence, experience, and soldierly bearing, to attend on generals, commanding officers, officers of the day, and staff officers, to carry orders, mess &c. They may be taken from the guard or put on permanently while the duty lasts: in the latter case they are reported on daily duty and are excused from all other duty that would interfere with their duty as orderlies. Broatch had an interesting military career that continued even after the Civil War ended. He was discharged from the 8th CVI in October 1863 and enlisted in the 14th United States Infantry as a sergeant in November of the same year. Broatch rose to the top of the enlisted ranks in the 14th quickly with a promotion to sergeant major only four months later. He won honors on the field of battle during the Virginia campaigns of 1864 resulting in a brevet promotion to first lieutenant in October of that year. He was elected to the Omaha school board in 1877 and became a charter member of the Omaha Board of Trade. He was appointed to the Missouri River Commission by President Chester Arthur…A solid Republican with “a tolerance for all people,” Mr. Broatch sought to correct the abuses of city government. He was described by detractors as “calculating” and as the builder of a political machine second to none. Broatch died in Omaha in 1922. Section 114, Customs of Service for Non-commissioned Officers and Soldiers, August V. Kautz, J.B. Lippincott & Company, Philadelphia, 1864.